What Day Of The Week Was February 21, 1937? 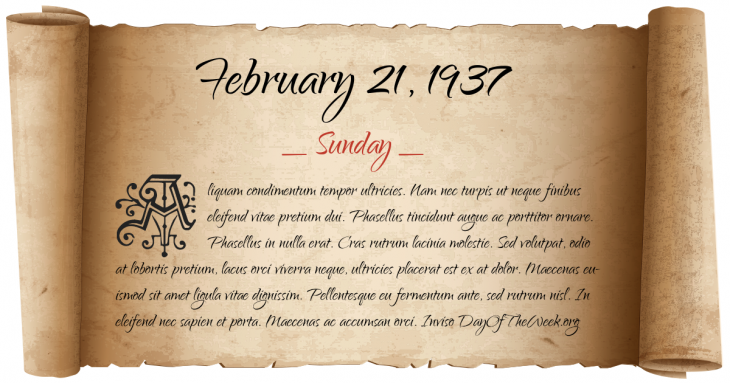 February 21, 1937 was the 52nd day of the year 1937 in the Gregorian calendar. There were 313 days remaining until the end of the year. The day of the week was Sunday. A person born on this day will be 82 years old today. If that same person saved a Half dollar every day starting at age 6, then by now that person has accumulated $13,908.50 today. Initial flight of the first successful flying car, Waldo Waterman’s Arrowbile. The League of Nations bans foreign national “volunteers” in the Spanish Civil War. Who were born on February 21, 1937?